Thank you to Cambridge Arts Council for a great weekend and the opportunity to show many new and recent works to invited guests and the public. Above: Cambridge Multicultural Arts Center, fall 2018. "Surfside Crest, Nantucket" in group show, center of wall under title heading. Below: University Place Gallery, fall 2017. "The Winter Dunes" in Mary Schein Fall Salon group show. Thank you to the staff and volunteers of the Marion Art Center of Marion, Massachusetts. Peggy Call-Conley, a local artist working in watercolors, and I were selected for a two-person juried show of coastal landscapes. Guests view the show, above. My painting "West Island Blue," shown here, was purchased by a visitor to the gallery. 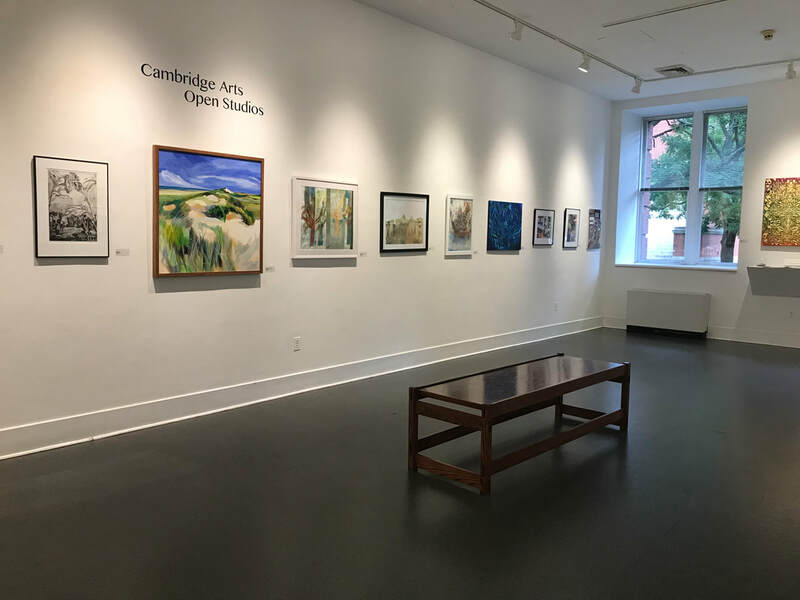 Thank you to the Cambridge Arts Council for a great weekend. This painting, "The Promising," was purchased while on display for Open Studios weekend at the Kathryn Schultz Gallery.